Various Process Connections: Thread, Tri-Clamp, Flanges, etc. 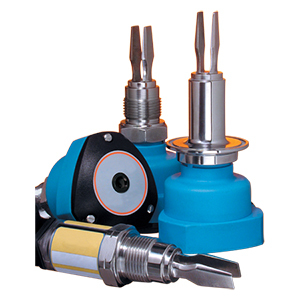 The LTU-2000 Series Tuning Fork Sensors are point level switches that are designed to detect low or high levels of liquids. The LTU-2000 Series is based on the vibrating tuning fork principle, using piezoelectric crystals. The switch vibrates at a resonant frequency. When the tuning fork is submerged in the product, the frequency changes. This change is detected by the integrated oscillator and converted into a switching output. All models are made with 316 Stainless Steel and are available with PTFE coatings or tri-clamp fittings for sanitary applications. The LTUM-2000 Series can operate in temperatures up to 120°C (248°F) and all have a maximum working pressure of 725 PSI (50 bar).